The University of Pennsylvania Glee Club records were donated to the University Archives by Bruce Montgomery and by the University of Pennsylvania Glee Club (accession numbers 2005: 43, 2005: 113, 2012: 19). The University of Pennsylvania Glee Club records are organized into five series, Award of Merit, General File, Photographs, Seasons, and Audio/Visual Material, which are arranged alphabetically or chronologically where appropriate. In 1862, eight University of Pennsylvania undergraduate students founded the University of Pennsylvania Glee Club, the first performing arts group at the university. More men were added along the way, and their first performance, in College Hall on the Ninth Street Campus, was very well received. The Glee Club continued to gain popularity during the decades following. By the close of the nineteenth century, it had become a regular fixture at sporting games and rallies, alumni events, and chapel services, and performed traditional songs as well as original songs such as “The Red and Blue,” “Hail! 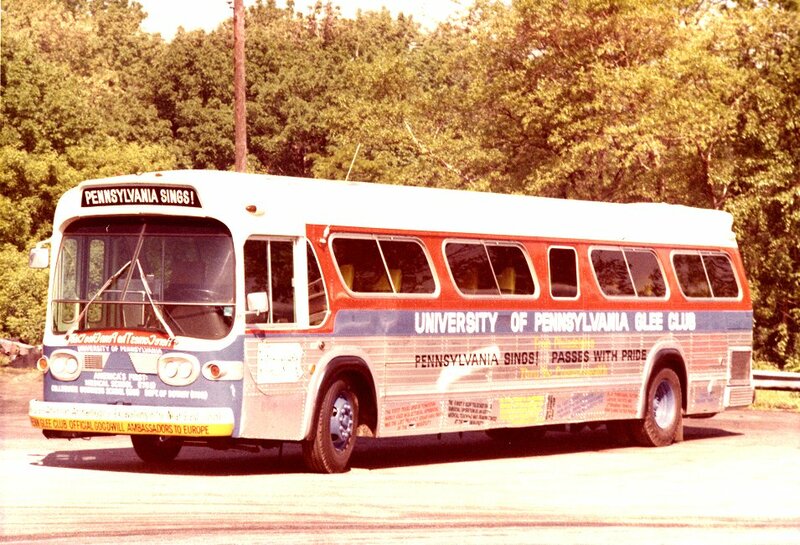 Pennsylvania,” and “Fight On, Pennsylvania,” songs which themselves have become part of University of Pennsylvania tradition. The Glee Club broke from the traditional notion of what a glee club is during their 1969-1970 season when, for the annual show, they staged an original production called “Handel with Hair,” written by Bruce Montgomery, Glee Club Director from 1956 to 2000. In this show the Glee Club combined their choral ability with theatrical showmanship, singing, dancing, and acting on elaborate sets and backed by a jazz band. The effect of this created something closer to a Broadway musical. Every season thereafter and continuing into the present day, the Glee Club’s annual show has been an original production marked by original music, complicated choreography, and clever, tongue-in-cheek dialogue that played off current events and issues. Bruce Montgomery – a man once described by the Philadelphia Inquirer as “the University of Pennsylvania’s musical Renaissance man” – wrote and arranged these shows until he retired in 2000. Under the direction of current Glee Club Director C. Erik Nordgren, the Glee Club has continued to stage an original show every season, typically premiering it in February. These shows, much like their original songs of the nineteenth century, have become part of university tradition. In 1959, the Glee Club embarked on its first international tour when it traveled to Puerto Rico. Since that time the Glee Club has embarked on several international tours, performing in over forty countries on five continents. They have performed in places as diverse as Taiwan and Bulgaria, and have performed for heads of state and schoolchildren alike. Domestically, they have performed in almost fifty states. The University of Pennsylvania Glee Club celebrated its 150th anniversary in 2012. Its status as one of the most lauded, recognizable and well-traveled of the University of Pennsylvania’s student groups remains. The records of the University of Pennsylvania Glee Club document several decades’ worth of this all-male singing group’s activities both on and off campus. The majority of the materials date from during the tenure of Bruce Montgomery, Glee Club Director 1956-2000. The series Award of Merit documents the process by which the Glee Club chose an individual to receive a specially engraved medallion and personalized citation in recognition of their contributions to the field of music. The award ceremony typically took place at a formal banquet held on campus. Recipients included Leopold Stokowski, Eugene Ormandy, Marian Anderson, and Arthur Fiedler. The series largely consists of correspondence between Bruce Montgomery, director of the Glee Club, and the award’s recipient and university administration, as well as with caterers, photographers, and other persons whose skills were required to plan and execute a large banquet. The General File series contains correspondence, news bureau releases, material generated by the Glee Club Graduate Club, and documentation pertaining to international and domestic tours as well as special one-off events. The Photographs series visually documents the activities of the Glee Club and includes photographs from the Award of Merit banquets, formal and informal group photographs of members, and photographs from their annual shows. The Glee Club operated in seasons that corresponded to the academic year. The Seasons series documents the planning that went into every season, starting with auditions in September through to final performances in the spring. The documentation of this work exists in the form of correspondence, clippings, itineraries, promotional material, and scores. This series also contains programs from most of the seasons. Constitution and By-Laws 1978, 1993, n.d.
Award of Merit 1964-1984, n.d.
Glee Club Graduate Club n.d.
Group Photographs ca. 1900-1928, n.d.
Afterglow (LP, two copies) n.d.
Hail Pennsylvania (compact disk and audio cassette) n.d.
University of Pennsylvania Band: University of Pennsylvania Songs (LP) n.d.